Four scholars from Tasmania attended the 2018 Crawford Fund conference supported by our TAS Committee. The Crawford Fund Parliamentary Conference was the first conference I have ever been to. I was initially very apprehensive about attending, it all seemed a bit overwhelming. I was reassured however, by the organisers and my lovely mentor (Suzie Gaynor from ACIAR) whom I found all to be very supportive and helpful. I have a background in agricultural science, and I am currently completing my honours; observing the effects of wood ash as a potassium fertiliser substitute in high pH coral atoll soils. Coral atolls are naturally low in potassium and thus, the people living on these atolls are very restricted in what they can grow and consume. As a result, islander nutrition is severely impacted, resulting in nutrient deficiencies as well as high cases of obesity. From this background I had preconceived ideas about the impacts of nutrition in agriculture. I found the conference reinforced my knowledge of agriculture and nutrition and truly inspired me to continue to pursue my passion for international agriculture and nutrition research. I was overjoyed that so many people are also concerned about this area of research and want to make a difference internationally and within Australia. The overall structure of the conference and organisation was impressive, and I thoroughly enjoyed networking with a wide range of people from diverse backgrounds. The speakers were very passionate and spoke clearly on a variety of topics, all of which I found both inspiring and interesting. I particularly enjoyed the topic presented by Dr Marco Woperies on the nutritional power of native vegetables, and one of the case studies which was presented by Philmah Seta Waken. The other networking and RAID events were also excellent. I enjoyed meeting other scholars and RAID organisers from around the nation and I am keen to remain in contact. My mentor was crucial to my successful networking as well as making me feel welcome and comfortable in this new environment. The majority of the speakers at the conference spoke about the ‘double burden of nutrition’. This is the fact that there are communities and individuals globally who suffer from either or both malnutrition and/or obesity. The implications of agriculture and subsequently diet on children’s development and expecting mothers was extraordinary. I didn’t realise the full extent of limited access to high nutritious foods in the first three years of life, which causes severe stunting and permanent brain damage to children. The key take-home message for me was that a lack of rural nutritional education leads to increases in malnutrition and obesity. The focus of international aid needs to shift from increasing quantity of food produced, to increasing the quality of food produced. I feel so supported and honoured to have received a Crawford Fund conference scholarship and I have grown and benefitted enormously from attending. I could not recommend the scholars program highly enough, as it has changed my outlook and career aspirations for the better. Being a Crawford Fund scholar is a distinct experience that I would highly recommend to every young student and early-career researcher in the agricultural sciences. I am an international student and was fortunate enough to be selected by the Tasmanian Committee to attend this year’s conference. My impression of the Crawford Fund conference was truly amazing, in that it gave me more than just a chance to learn about Australian and international agricultural research. It was a perfect platform to engage with research, to glean from real-life lessons from around the world and to be made aware of the expectations in science and labour markets for meeting future demand. An ‘extra’ gift designed by the organisers was the networking opportunity in both the scholars’ days and the Parliament House event, where we were able to learn about the wider learning opportunities and working possibilities. It enabled us to actively engage with students, senior researchers and politicians, an opportunity I would not otherwise have had. As a scholar, I was assigned a mentor, David Gale, who we could share experiences with and to help network more effectively. For all those reasons, I would never regret to travel to Canberra this time though many tasks are waiting on my office desk in the final year of my PhD project. During this year’s conference on “Reshaping Agriculture for Better Nutrition”, many prominent issues were presented and discussed. Despite our diverse backgrounds, the firm consensus about the future of agriculture was to focus on quality rather than quantity – something that hasn’t been sufficiently addressed to date. Several presentations highlighted the insufficient intake of vegetable or lack of micronutrients as a challenge for both developing and developed countries. Stunting and obesity are a global problem and are not restricted to any particular country or region. These findings showed the necessity for the collective action of scientists and non-scientists, stakeholders from both the private and public sectors and all people everywhere. How do we achieve collective action? We may need to reconsider or revise our mindset; more voices and perspective need to be heard. People of different socio-economic and cultural background with different level of education, experiences and political statuses certainly hold different views. Any future solutions or interventions need to work hard to embrace diversity in practice, to ensure the sustainability. I was very impressed by, and wholeheartedly agree with, Dr Anna Okello’s comment in the Q&A session that technical solutions are somewhat easy to achieve but bringing them into a local community would be much harder since they might not be contextualised enough. Collective action has the potential to be a win-win strategy. Once again, I would like to express my gratitude to the Crawford Fund, sponsors, speakers and scholars for this wonderful experience that offered me a lot to learn, to think about, and to enjoy. This year I was fortunate to receive a scholarship from the Crawford Fund to attend the Crawford Fund conference. I would like to thank the Crawford Fund committee for providing me this great opportunity to participate in the conference focused on “Reshaping Agriculture for Better Nutrition – The Agriculture, Food, Nutrition, and Health Nexus” 13-15 August 2018 in Canberra, Australia. The world’s population is projected to increase to 9.7 billion by 2050 and 11.2 billion by 2100, and to feed this many people, we need a 70 per cent increase in food production by 2050. However, food security does not only encompass the availability of food but also the nutritional value. Multidisciplinary approaches are needed to ensure food security and find solutions to large-scale malnutrition. 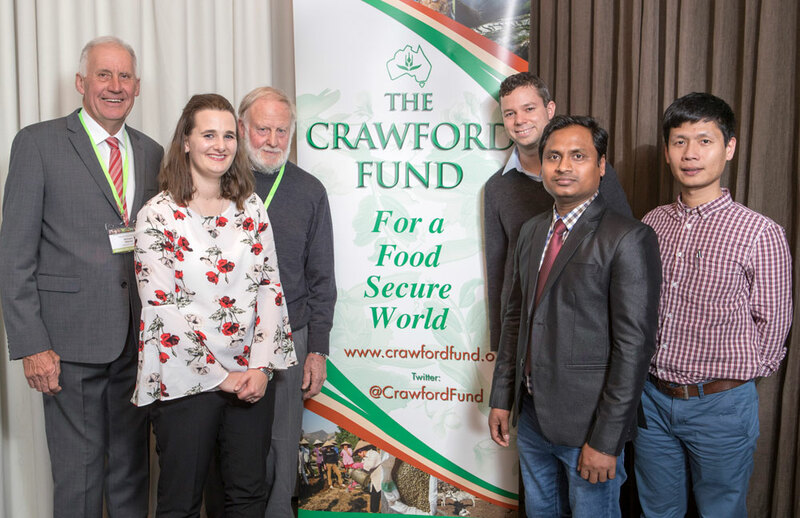 The Crawford Fund Conference was a fantastic platform to listen and learn about the global food problem, food quality and nutrition from world-renowned agricultural scientists. This conference was also a platform for me to talk with people of different organisations (ACIAR, World Vegetable Center, ICRISAT, CIMMYT, IRRI, World Fish Center) and scholars from different Australian universities whose research is contributing to global agricultural development. Meeting with my mentor, Dr Anthony Ringrose-Voase was a great experience, and I am very much impressed by his valuable suggestions for my future career. I was very much impressed by the keynote speaker’s presentations during the conference on the global food problem, food security and different policies to increase global food production to meet the food demand for the rising human population. The Sir John Crawford Memorial Address by Ms Frances Adamson on the malnourishment crisis including the global disparities in nutritional provision and health implications was very impressive and informative and motivating. I was also very impressed to see that many ACIAR projects are going on to increase the food production for future food security in my country, Bangladesh and many international agricultural scientists are working on it. Meeting with other agriculture scientists, RAIDers, volunteers and ACIAR in the networking session was another excellent opportunity to discuss the future possibilities in the agriculture field to work with in joint venture. It gave me an opportunity to know about the other people’s work and their future ambitions and also, I got the chance to discuss my work and plans for the future. Suggestions from the mentors further encouraged my wish to carry out research in the field of agriculture for food security. Taken together, it was a great opportunity for me to connect with these world-class agricultural scientists, whom I hope to work with in the future. It was my great fortune to be selected as a Crawford Fund Scholar for Tasmania, and to get the chance to attend the 2018 Crawford Fund Conference in Canberra. At the conference, I was so impressed by the exceptional quality of the speakers throughout the event, who expertly covered serious and complex topics in a concise and approachable way. At the beginning of the conference, Alessandro Demaio and Jessica Fanzo outlined the global challenges of nutrition, providing the background for many of the later talks. As someone who has worked in agricultural and food science, a particular highlight for me was the way speakers were able to integrate food nutrition into the context of agricultural production that I’m more familiar with. And for someone just starting my career, it was inspiring to see firsthand in Dr Demaio an example of an Australian researcher who has gone on to take a key role in his field on the global stage. Key messages from the conference included the critical role of nutrition early in life, and how important it is in shaping future health outcomes. Similarly, the concept of hidden nutrition issues, where people have enough food to eat but not the nutritional balance to flourish. Also, the global over-dependency on the “big three” crops of maize, rice and wheat, and how adding even only two more main crops into the mix (sorghum and millet were proposed) could increase both productivity and food security. Also, of interest were the possibilities presented by the use of GMO crops, as well as obstacles in the way of their wider use. Most inspiring of all for me though was the conference summation by Prof Robyn Alders, who noted not only the challenges raised by the speakers throughout the day, but also with great skill wove in her own experiences and knowledge (in fact, I think this would make a great TED talk or similar in the future!). Throughout the conference, it was great meeting so many people from different fields but with common interests, who were approachable, friendly, and willing to share their experiences. Also, the various networking exercises on the first day, and just having a personal mentor to introduce you to others, was a great way of breaking the ice. While the challenges to be faced to provide adequate nutrition for the world’s population are enormous, the enthusiasm of my fellow delegates was hugely encouraging. Additionally, learning about the various ways different people have started their careers in international development was very instructive and inspiring, showing the many potential paths to get involved. My huge thanks to the Tasmanian Crawford Fund Committee for funding my participation at the conference. Special thanks also to Cathy Reade and her team for organising such an informative, wide reaching and smooth-running event. Also, to the RAID network, whose enthusiasm and keenness to share their passion for international development really shone through. Finally, I would highly recommend the conference to anyone with an interest in the role of food, agriculture and other resources management in international development.